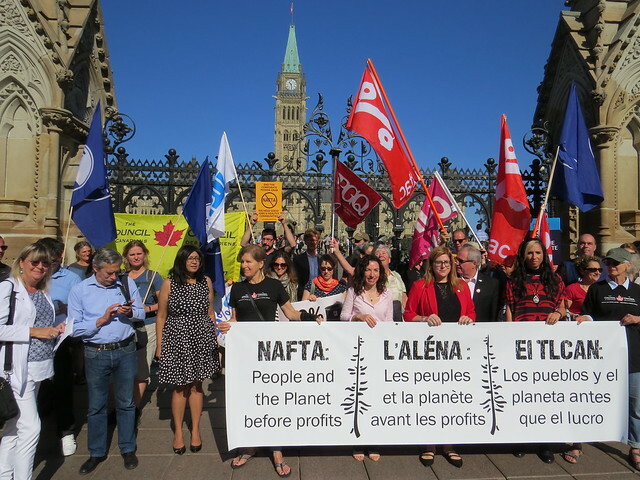 While at the beginning of the deal, the Council of Canadians had some hope that NAFTA could be improved, the latest developments point to a deal that would once again entrench corporate power. According to the New York Times, there will be no language to support the commitments of the Paris Climate Agreement. Case in point: Chapter 11. This week will be pivotal for Chapter 11. Canada is defending this discredited dispute resolution system, which enables multinational companies to sue governments over changes in public policy that get in the way of profits. Canada, the most sued party in NAFTA faces $2.6 billion in outstanding cases. In addition to corporate Canada’s demands, the new demands and ultimatums from the U.S. also have a similar pattern, giving more rights to U.S.-based big business. Barlow is sceptical that NAFTA can be remedied, and reminds Prime Minister Trudeau that Canada can live without NAFTA.